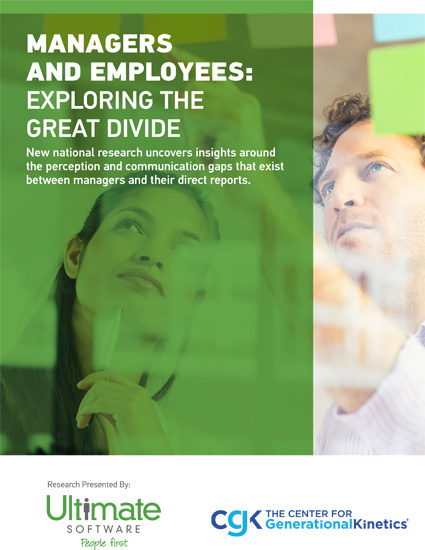 New national research uncovers insights around the perception and communication gaps that exist between managers and their direct reports. An engaged manager leads to higher levels of engagement among their employees; still, most employees think they can function in their role without a manager. What went wrong? Ultimate Software has partnered with the Center for Generational Kinetics to study the critical importance of relationships and interactions between managers and employees. Take time to focus on your most important part of the organization: your people. Access this exclusive talent management guide for the results of a captivating new study, asking tough questions like what makes a good boss, why there is a disconnect at work, and what you can do to adapt to the changing workforce.